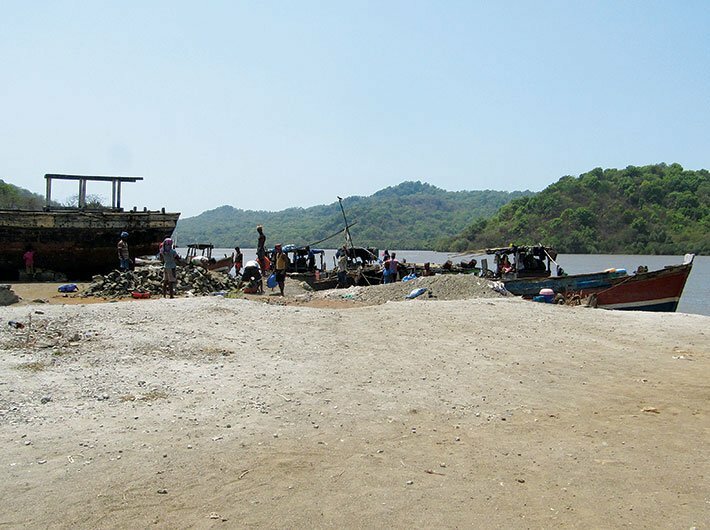 Sand mining was once an activity that provided an alternative source of livelihood to the fisherfolk living on the outskirts of Mumbai. Today, relentless, mechanical sand mining has not only snatched away a source of income for the locals; it has also caused extensive ecological damage. “Till a few years ago, this place was dotted with mounds of sand piles. Hundreds of trucks and lorries stood choc-a-bloc right up to Kasheli at Mumbra,” says Nandkumar Pawar, a fisherman and an environment activist as I visit Gaimukh village creek at Ghodbunder Road, some 10 km away from Thane city. It’s a hot April afternoon. I am on my way towards Kolshet village creek when Pawar warns me about the modus operandi of local sand mafia. A little later, at Kahler village in Bhiwandi district as we step out of vehicle to look around the creek, a motorcycle whizzes past and takes a U- turn to come back to the spot where we stand. Pawar is now worried and wants us to immediately leave before the locals ‘gherao’ us. We quickly return to the vehicle and drive to Kasheli village creek in Mumbra. The 12 sq km area, having around 10-13 coastal villages, is a busy sand mining belt. But, that afternoon, there is no activity. This area has been inhabited by the fishing community for generations. These people engaged in manual sand mining as an alternative source of livelihood. According to community elders, way back in 1952, then Maharashtra revenue minister Mustafa Faqih had reserved the land for manual sand mining so as to provide them an alternative source of livelihood from fishing and farming. However, no official document to authenticate this claim was made available to Governance Now. Over the years, ecological destruction and loss of marine life led to non-availability of fish, the only source of income for the community that has been living here for almost 150 years now. It has been a gradual deterioration that has been compounded by many chemical and pharmaceutical companies based in the vicinity dumping their untreated hazardous waste into the sea. The toxicity has caused the fish to die, endangering marine ecology. “Norms, rules and regulations for treating dangerous chemicals and effluents before dumping them in the sea are not followed to save money. This has affected marine life. It is in close proximity to Mahim creek in Mumbai. The effluents and untreated liquids from the dumping grounds of Cooperage, Mahim, Deonar and Kanjurmarg have contaminated Thane creek. Despite complaints at the local level, no action has been taken. I used to fish twice a day earlier but post-2000, we rarely see any fish,” says Pawar, who founded Shree Ekvira Aai Pratishthan (SEAP), an NGO. The post-1990 construction boom was a double-edged sword, with builders dumping construction debris into the sea and also dredging sand to meet the construction requirement. Suction pumps were put to use, as against manual mining. “Machine dredging happened with the involvement of people with money and muscle power within the fishing community and the involvement of politicians who started mining on a large scale. For others in the community, it is a reluctant choice as they are pushed into this business for survival,” adds Pawar. Nearly 60,000 labourers from areas like Jawhar, Mokhada, Wada from neighbouring Palgarh district as well as those from Bihar and Jharkhand are engaged in the work during peak season for machine dredging of sand, which is post-monsoon. Once the coast is clear, a pipe is inserted in the creek bed to check availability of sand. After sand is detected, a man will dive down and fill a bucket which will be pulled up by the machine set on jetty/boat. This operation generally takes place at night time. Depending on the quality of sand, miners earn anywhere from Rs 6,500-7,500 per brass. Though excavation beyond 3 metres under the ground is banned by the Maharashtra Maritime Board, violations are rampant as sand is not available at that level. On top of it, there are fixed expenses. The labour has to be given food and money and boat rent has to be paid. Sand generation depends on monsoon and tide pattern. Reputed builders get their sand from Gujarat, considered to be of best quality for construction. Sea water is very saline and has poor strength value. This sand is largely used in construction of buildings in areas like Diva, Mumbra, Bhiwandi and Thane where a large number of buildings are illegal. Balakrishna Ramachandra Gharat, a fisherman and manual sand miner of Kolshet, is worried and stares at a bleak future. He says, “Our community is destroyed and our boats are standing without work. For the last two years, entire families are sitting at home without work. The only job available is that of watchmen for builders. Without providing an alternative source of income, the government is telling us to close everything. “They have now planted trees on our sand plots, put up boards prohibiting us and not allowing trucks and lorries here. This was our means of livelihood for 150 years. Now under the garb of creating smart cities, they have outlawed us. We went to MLAs, MPs and the mayor. All threw up their hands, saying they are helpless,” he adds. Another fisherman, Prahlad Mhatre who has been working as a manual sand miner for 28 years after passing class 10th, says since there was no job available for him, he would do odd jobs in farming and fishing. “This is the profession of our past generations. As many as 15,000-20,000 families in my village are dependent on sand mining which causes no harm to environment. We pay a royalty of Rs 1,500-3,000 per truck to the government. But for the last two years, no job is available,” he rues. He adds that till “the government started imposing restrictions post-2005 Mumbai floods, it was free and open trade. Post limitations, illegalities started to take place. The situation worsened after 2013 when sand was mined only though machines. Suction pumps were used to take out sand as a result of which no sand was available for manual dredging”. After the Bombay high court order of 2013, mining has almost completely stopped. Most of the land has been taken over by the Mumbai metropolitan region development authority. “In Kasheli and Kahler villages, almost 195 acres of fishing land is reserved for fishing community, which slowly came to be occupied by builders and politicians who have constructed illegal structures. Due to this, the fishing community lost their land,” says Pawar, who filed an RTI query to know the status of these 195 acres but did not receive a reply. For those in the community who want to live honestly and go about their work, the concern is of livelihood. As many are illiterate, they are unable to find jobs. The community however is too scared to take up cudgels for its own people or is afraid to ruffle the feathers of the powerful. “More than 50 percent of Mumbai’s population lives in slums and are migrants. The government provides them facilities, takes care of them and rehabilitates them. On the contrary, we are locals but have been given ‘adivasi’ status. The government should be sympathetic to the community which is left without a source of income. We live in harmony with nature but now our faming and fishing is extinct, yet the government is reluctant to help the community. It must provide us with alternative means of livelihood,” says Pawar. “We are asking the government to come out with a clear cut policy,” he adds.